Alexandria, Virginia, is famous for its holiday traditions and festivities. See why the city was named a Top 10 Christmas Town by HGTV and take part in signature events throughout the season, like the Scottish Christmas Walk Weekend and the Holiday Boat Parade of Lights. Skip the mall and start a new family tradition by getting pictures with Santa Claus in Old Town any Saturday or Sunday between Thanksgiving and Christmas, and shop locally owned boutiques and art venues for gifts. Feel transported by an old fashioned sense of holiday wonder as you celebrate, dine and shop on early-American historic main streets. For parades, candlelight tours, festive performances and more, check out the listings below. Go to www.visitalexandriava.com/ for even more on Alexandria&apos;s event calendar. Even the dogs wear tartans during the annual Scottish Christmas Walk in Alexandria, Virginia. On Saturday, December 1, more than 100 Scottish clans dressed in colorful tartans will parade through the streets of Old Town. They&apos;ll be joined by pipe and drum bands from around the region, as well as terriers and hounds of every description. The Saint Andrew&apos;s Society of Washington, DC, partners with the Campagna Center and the City of Alexandria to host the annual parade. Other events of the weekend include A Christmas Marketplace and A Taste of Scotland, both on November 30, and the Campagna Center&apos;s Holiday Designer Tour of Homes on December 1. Consistently ranked by the Southeast Tourism Society as one of the top 20 events in the South, this event has grown from a small informal parade to an entire weekend filled with events and festivities. At sundown, Alexandria&apos;s harbor lights up when more than 50 illuminated boats cruise the Potomac River at the historic waterfront, led by Alexandria&apos;s fireboat Vigilant and Washington, DC&apos;s fireboat John Glenn. Admission: $15 before December 17; $20 after. Children 12 and under and active military are free. This annual New Year&apos;s Eve bash takes over Old Town Alexandria with 100 performances at 18 indoor venues, with live music, dancing, and children&apos;s face painting and games. The afternoon Fourth Annual Fun Hunt is joined by all-new activities for families - and dogs! First Night&apos;s beloved fireworks finale returns at a NEW location, with a spectacular display over the Potomac River at midnight. Afternoon activities, 2 to 5 p.m. Performances, 7 to 11:15 p.m.
8 p.m. Thurs.-Fri., 3 and 8 p.m. Sat., 3 and 7 p.m. Sun. Local retailers open early with once-a-year deals sure to lure shoppers to Old Town Alexandria. Participating stores offer 30% discounts from 6 to 8 a.m., 20% from 8 to 10 a.m., and 10% starting at 10 a.m. The city is offering free parking at meters and in city-owned garages. New this year, the Free King Street Trolley will begin at 6 a.m. Stay for the city&apos;s annual Tree Lighting Ceremony at 7 p.m.
As the official kickoff to the holiday season, the city tree is lighted. Entertainment features a visit from Santa, a performance of Santa&apos;s Frosty Follies by the Metropolitan Fine Arts Center, caroling and a community sing-along. Come out to Old Town Alexandria and view the festive Window Wonderland of holiday lights and decorations on display at our local boutiques. Shoppers are invited to vote for their favorite window décor via Facebook and Twitter. Hours: Saturdays, 9 am to 4 p.m. except for December 1 (Scottish Walk Parade day) when hours are 1 to 5 p.m.; Sundays, Noon to 5 p.m.
Santa and Mrs. Claus are back in Old Town Alexandria to take pictures with children every Saturday and Sunday between Thanksgiving and Christmas. Presented by the Old Town Boutique District in partnership with the City of Alexandria and Bike and Roll Alexandria and with the support of area businesses. The cost for pictures is $15 for a 5 x 7 print. Join the Torpedo Factory Art Center&apos;s artists for the annual Holiday Open House! Shop for one-of-a-kind gifts while enjoying sweets and savories from Bread & Chocolate. Three weekends: November 30-December 2, December 7-9 and December 14-16; Fridays from 6 to 9 p.m., Saturdays from 10 a.m. to 4 p.m., and Sundays from noon to 4 p.m.
Join us for the 17th annual Holiday Market! The Market offers unique handmade fine arts and fine crafts from local artists (including pottery/ceramics, photography, jewelry, cloth, paper crafts, and glass) and delicious bake sale items to benefit a local non-profit. Admission is free. All artists donate a percentage of their sales to help support Del Ray Artisans. Friday, 7:30 p.m.; Saturday, 1 p.m. and 6 p.m. Begin your holidays in the brightest way, with the Alexandria Harmonizers happy holiday dinner show! Featuring seasonal favorites in caroling and choral masterpiece sets; a light hearted musical play starring the one and only "Jack In The Box"; plus a delicious dinner served by your singing Harmonizer waiters! TICKETS NOW ON SALE at http://www.harmonizers.org for the sixth anniversary of this popular event, Always a sell-out. Old Town&apos;s landmark, The Christmas Attic, has partnered with area schools, churches, and community groups again to help produce its annual temporary exhibition featuring illuminated canvases of art for The Christmas Attic&apos;s Holiday Advent Calendar Event. From December 1 through December 24, each day at sundown, the store will reveal "advent art" featuring a variety of local holiday creations. All art will be placed either in the windows or on the brick of the building on the front side facing Union Street. Visitors can picture the entire building being transformed into an advent calendar. There will be holiday entertainment and activities inside the store for shoppers to enjoy on a variety of nights. At the closing of the Advent Calendar event, the canvases of advent art will be available for auction at a post-event celebration (to be scheduled). Proceeds from the auction will go to the Make-A-Wish Foundation of the Mid-Atlantic. In early December, the entire community comes together to light the neighborhood Christmas tree. Even Santa attends! This joyous celebration is followed by an evening stroll down the Avenue, which is illuminated by thousands of candles, called "luminarias". The Little Theatre of Alexandria&apos;s "A Christmas Carol"
Ring in the holiday season with a return of the classic by Charles Dickens. Ebenezer Scrooge, a miserly Victorian humbug, travels with ghostly guides through Christmas past, present, and future to find the true meaning of the holidays. Complete with special effects, Victorian carols, and Tiny Tim, "A Christmas Carol" is a must for the entire family. Join a Civil War-era Santa at this family-fun holiday event that explores how Christmas was observed during the Civil War. The program features living-history interpreters, a Victorian Christmas tree, period music, refreshments, readings of "The Night Before Christmas" and a patriotic Santa Claus inspired by Thomas Nast&apos;s Civil War cartoon. Guided tours of the fort, weather permitting. Saturday, December 8, 6 to 9 p.m.; Sunday, December 9, 3 to 6 p.m.
Special pre-sale discount if tickets purchased before December 1. Take a break from the fast pace of the season and enjoy the unique charm and history of Old Town at this popular holiday event. Tour Gadsby&apos;s Tavern Museum, Carlyle House, Lee-Fendall House and the historic Bank of Alexandria building by candlelight and enjoy seasonal decorations, entertainment and light refreshments. Special this year - a holiday taste of historic chocolate, co-sponsored by the Historic Division of Mars, Inc. Admission: $28.95 adults; $15.95 kids age 4 to 12; age 3 and under FREE! Please join us for our 5th annual Breakfast with Santa. The elves will begin seating at 9 a.m. as we eagerly await Santa&apos;s arrival. Don&apos;t forget to bring you camera! There will be plenty of time to sit on Santa&apos;s lap and share your list with him. A full breakfast buffet will be available. Enjoy this great family tradition! The Torpedo Factory celebrates the season with two holiday staples - chocolate and shopping! Studios and galleries will be open until 9pm for holiday shopping and sweets and wine will make for a decadent evening. Visit Target Gallery for the 5x5(x5) exhibition reception. Enjoy the reception for Suzanne Vigil&apos;s solo show, Up Close & Personal, and browse handcrafted ornaments in The Art League Gallery. Get creative at our DIY craft station, and enjoy other festive activities. 2 p.m. & 4 p.m.
Join the Colonial Handbell Ringers as they present their festive holiday musical show! Get into the holiday spirit as you listen - and sing along - with their one hour performance of holiday classics. 2 p.m. with repeat performance at 4 p.m.
A thrilling night of great music and song. Experience Frank, Dean, and Sammy - the original Rat Pack - performed with a wonderful mix of song, comedy, sketches, and brilliant musical arrangement. A sensory experience you don&apos;t want to miss - the music that inspired and thrilled an entire generation! Christmas with the Rat Pack brings these characters to life and make them vibrant. The Rat Pack will be singing all your favorite Christmas songs. 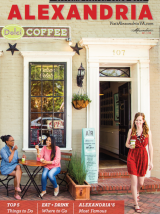 Located along the picturesque Potomac River within eyesight of Washington, DC (just five miles away), charming Alexandria, Virginia, was named a Distinctive Destination by the National Trust for Historic Preservation for its urban charm that blends an extraordinary American past with modern flair. Alexandria offers a variety of critically acclaimed restaurants; a boutique collection featuring designer clothes, shoes, antiques and home decor; a thriving art scene; a variety of hotels; and hundreds of years of American history among 18th- and 19th-century architecture.